John Bailey has the benefit of more than 40 years experience in knife throwing and taught several hundred people, among them army rangers, the basics of the sport (see what John tells about his life). 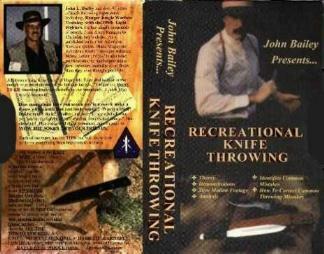 Now he put together his knowledge in this instructional video titled "Recreational Knife Throwing". After a short introduction, John explains the safety rules that every knife thrower should heed. Following that, he presents quite some knives from his collection, normal off-the-shelf knives as well as special items like the "ballistic knife" (which is said to have been developed by the KGB). Now, the tape proceeds step for step to the first throw. Different stances are shown, then follows some training for the throw itself. The most common mistake, side arming, is taken care of. And of course it is explained how to correct the distance to the target if the knife does not stick properly. Apart from the different grips, John presents some of the target constructions he has in his training area. Slow motion sequences of various knives thrown from different distances and a short summary of the most important points complete the tape. All in all, this video is a good introduction to the topic of knife throwing, and beginners will soon have their first knives sticking. Advanced throwers will especially like Johns description of his technique (I really enjoy his natural "branch chopping technique") and his remarks and tips regarding popular knives like the ones by Gil Hibben. The tape has a duration of about 70 minutes, the language is an easy-to-understand English (and the movements filmed in slow-motion speak for themselves :-) Originally the video was sold as video cassette, through a cooperation with the author we can now offer it as a professionally pressed DVD. The format is NTSC, which means the DVD will play on European and US players and computers. You can buy this video on DVD in our online shop.